Manila, Philippines -- As Manila’s smartest logistics provider, Transportify App continues to create and add improvements not only to our web and mobile application, but also to the services we offer. We are proud to announce another addition to our user-experience enhancements: the new Customer & Driver Chat App Feature! 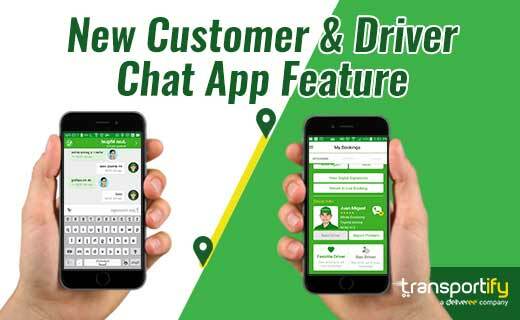 The new Customer & Driver Chat app feature allows customers and Transportify delivery driver partners to chat real time. Before, only the customer service chat is available for both users and drivers. Back then, if the user needs to ask the driver something, the user has to contact the customer service so the customer service could then ask the driver and vice versa. Now, both the user and driver have direct contact to each other, making the communication faster and the transaction smoother than before. How can users chat with delivery driver partners in real time? Easy! For mobile app users, you can find the Customer & Driver Chat button under your upcoming bookings where you can see the driver’s info. There, you will see a phone icon inside a dialogue balloon beside the driver’s picture. For web apps, you can see the Driver-Chat button on the lower left-hand corner of your computer screen. Just click the button and a chat box will pop up where you can send chat messages directly to your assigned driver partner. With the Customer & Driver Chat button, you can track and trace your package in another way aside from using the Transportify fast track courier feature. 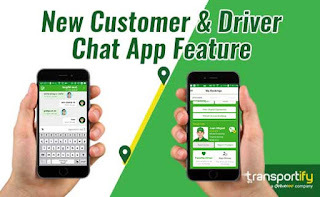 To find the Customer & Driver Chat App in your Transportify web and mobile app for delivery service, you have to download the application update. The Customer & Driver Chat button will be visible in your Transportify web and mobile app after you download the application update. When you click this button, you will find the option to send a chat message to the driver or the customer service representative. You can also directly call either the driver or the customer service representative. We retained the customer service chat and call options so users can still ask inquiries that are not within the driver’s job or knowledge. Booking with Transportify is now even more convenient and more seamless! To enjoy the Customer & Driver Chat app feature, download the Transportify App update now!